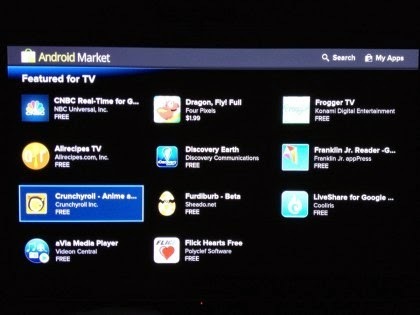 This week, Zatsnotfunny.com has posted up some new screenshots showing off the new user interface of Google TV 2.0. As promised, this new version is based on Google's Android 3.1 operating system, also known as Honeycomb. It will allow Google TV owners to download and use a number of new apps, including the Wall Street Journal and more. Google TV owners can also rate the apps they use just like their Android app counterparts. Google has announced it is seeking more hardware partners for Google TV, but so far the company has yet to reveal any new companies that will offer Google TV on their products. There's also no word on when the big 2.0 update will actually be released, although it should be any day now. Google's executive chairman Eric Schmidt recently affirmed the company's support for Google TV, saying, "We're absolutely committed to staying, to improving Google TV."